I've completely failed to keep this blog up to date. This is partly because I've been lazy, but also because I've been fairly busy. Since I call people at home quite frequently, I am less inclined to write. Now that I've been back in the states I have less of an excuse, although I have been quite busy lately. In the last seven weekends, I've been to Doha, Dubai, Cairo, Boston (suburbs), Pittsburgh and New York City and in a week and a half, I'll be in the San Francisco bay area. At this point I'm tired of traveling, and am looking forward to settling down, although I'm apprehensive about moving to the west coast permanently. I'm definitely glad I took the time to travel, as I only get 12 days of vacation with my job at Apple, so I may never get an opportunity like this again. Overall I'm very glad I spent a semester in Doha. My parents' fears about safety turned out to be unfounded, as Doha is probably safer than most American cities. I was also way too busy to get bored, as many people thought I would. The end of the semester was a success. I am proud to say that everyone passed the algorithms class. This means that there will be ten seniors graduating from the Computer Science program this year with 3 more graduation in August after they complete some additional work. Since CMUQ has only been around for 4 years, this will be our first graduating class. The success of our students in algorithms vindicates the hard work of the faculty and staff here. There is always the concern especially among faculty in Pittsburgh, that the education students receive here is inferior to the education they would receive in Pittsburgh, but in algorithms we gave the same homework and tests. I was especially harsh in grading the final so I can comfortably say that the grades students received aren't due to grade inflation, but are the product of a semester of hard work. CMUQ may lack the superstar students that Pittsburgh has, but that's a function of the class size. Fewer students mean fewer As but fewer Fs as well. I promised in my last entry that I'd talk about some of my experiences outside of school. I did many actives that I'd normally do in the states, like go bowling and go to the movies, though I admit that watching a movie like Vantage Point, where the villains are Muslim terrorists seems a bit different when you are watching the movie with a Muslim majority audience in the middle east. Other activities were quite different, such as watching camel races, and going dune bashing in SUVs and quad bikes in the desert. Toward the end of the semester I've spent very long days at the office helping students complete the semester and prepare for the final. Other than that I mainly keep myself busy by biking. I had my bicycle shipped out using my generous shipping allowance. Every Friday and Saturday morning there is a group of about 4 to 6 riders get together at the dean's house. To tell the truth, riding here is not that great. It's completely flat, usually windy with not much to look at. Also towards the end of the semester, as expected, it started to get incredibly hot. This meant to beat the sun, we'd have to get up at the ungodly hour of 4:30 or 5:00 to go for a ride. Nevertheless I had a good time. Biking in Qatar could present unique challenges that would not occur elsewhere. For example, one day I was doing a 20 mile solo ride in the desert behind my apartment complex. On the way back a lone camel stood in the middle of the road blocking my path. Since Qatar is such a small country, it is possible to bike across it in a single day. I didn't quite manage to do this but did an 80 mile ride across half the country. You can see pictures here. The ride was supposed to be 100 miles, but I was out of shape and the heat did me in. What's kind of embarrassing is the 3 guys I was biking with were much older than I, including the dean, who's in his 50s, and yet they finished fine. We took advantage of the massive construction that is occurring across the country, to ride on roads that were not yet open to traffic. A little over half way through the ride, we ran low on water, so we stopped at a grocery store on the outskirts of Al Khor, a settlement north of Doha. As would be expected, people outside the capital are much more conservative, so when we walked into the supermarket with our spandex biking shorts, we were met with stares of disapproval. Remember, this is in a society where exposing your kneecaps is considered impolite. The people in the supermarket were in such a hurry to get us out of there, they had us cut the entire line. Todd, one of the guys I was biking with, later told me that a "conservative gentleman" reprimanded him for wearing shorts. When Todd complained about the heat, the man simply told him that he should not be biking in this weather, and he should be riding in an air conditioned car. This stands in stark contrast to the younger generation, especially those enrolled in Education City. It seems American pop culture has infected the world, and Qatar is no exception. In the hallways I could hear people discussing the latest Brittany Spears shenanigans, and when I attended a barbecue party my students threw, they danced to hip hop music, including some of the women whom I thought would be more conservative, since they wore abayas. To celebrate graduation, my students wanted to play paintball. When one of the faculty members convinced them that this was a bad idea, they settled for a water ballon fight instead, during which their abayas got quite soaked. Much bigger than the difference between generations is the difference between classes. While Qatar has improved quite a bit over the years, human right abuses do occur which you can read about here. The working migrant labor force that makes up the majority of the population of the country remains largely hidden and ignored. Class segregation is the norm and any intentional or unintentional breach of this creates an awkward situation. I have two stories that illustrate this. For spring break, I met up with my family in Istanbul. To get there, instead of taking the more expensive direct flight with Qatar airways, I flew Gulf Air with a layover in . When I got to the Doha airport, there were two lines to go through security, one for Qatar Airways, and one for everything else, which is considered lower class. I got in the non Qatar Airlines line with a bunch of Nepali migrant workers catching a flight to Katmandu, so naturally I stood out as an American. Soon after I got in line, I was approached by an airport employee who asked me if I was in the correct line. When he didn't believe me, I had to show him my Gulf Air tickets. He then told me that I needed to move to the front of the line, cutting about 20 Nepali workers in the process. I complied since I didn't want to make a scene, but I felt a bit guilty about the whole thing. The Nepali workers didn't complain, I guess they are used to treatment like that. The reverse situation happened when I took a weekend trip to Dubai. On a Friday night I was trying to get back to my youth hostel from Dubai Creek by bus. Unfortunately Friday is the day many migrant workers have off, and many of them needed to take the same bus to get back to their quarters. While Dubai has tons of oil money and foreign investments, most of this money goes towards catering to the rich and building extravagant things, such as the Burj Dubai, and improving the mass transit system is not a high priority. Thus the buses run very infrequently and are quite crowded. I waited at the bus station with hundreds of migrant workers for an hour and a half before I got to the front of the line. Right when I was about to get on the bus, one of the guys working at the station blocked me from getting on the bus and said something in a language I could not understand. Then he let a couple of the migrant workers standing behind me get on the bus, and the bus took off. Since I wasn't sure if they would let me on the next bus, which probably wouldn't come for an hour, I decided to try to catch a taxi instead. Unfortunately, as it was rush hour on a Friday, many people were trying to catch taxis and I tried for half an hour to hail a taxi, but ended up without a ride. There were a few people in unmarked vehicles that offered me a ride, but they wanted twice the fare that taxis charged, and I wasn't sure if I could trust them, so I turned them down. I ended up walking back to the youth hostel which was about 10 miles away. I didn't have a very detailed map of Dubai, so I ended up getting a bit lost in the process. Most of the walk was along sidewalks next to well lit roads with a lot of traffic. Towards the end it got a bit interesting, as I ended up walking on the sand, next to the main high way through the UAE, and I had to run across merging lanes and cross an overpass. The walk took about 3 hours and I arrived back in my room around midnight. Luckily Dubai is a very safe city, and nothing bad happened to me, but it probably wasn't the best decision I made. Since there is so much to write about, I can't possibly write about it all, I will share a random story. Perhaps the craziest thing that happened to me in Qatar occurred when driving back form a day of dune bashing with Zaher and Irmgard. Zaher is a male Arab Isreali grad student in computer science from the University of Michigan, and Irmgard is a female Austrian postdoc from the University of Vienna. We all share an office so I hung out with them a lot. By the time we were driving back from Sealine beach resort, in the southern part of the country, it had already been a long day. I helped proctor a high school programming competition in the morning and spent the afternoon driving a quad bike through the sand dunes. On the drive back to Doha, we made a wrong turn and instead of taking the short way along the coast, we ended up driving the long way through the middle of the country. The road we ended up on, which we later learned was called Al Salwa road, was under a lot of construction and was heavily trafficked by large trucks. Naturally the road quality was very poor and there were many pot holes. When we were about 30 miles away from Doha, as she exited a roundabout, Irmgard hit a huge pothole. Similar to what happened to me in my first week in Doha, this pothole bent the rim of the front right wheel and flatted the tire. When we got out to swap in the spare, the sun had already set. When we were finally on our way again, we heard a strange noise from the back tire as well and came to the realization that it was slowly going flat. We couldn't pull over immediately, as the entire right side of the road was blocked off due to construction, so we turned on our emergency lights and drove extremely slowly to the next exit, all the while huge trucks thundered by on our right. Since we had already used our only spare, we were now stuck in the middle of the desert. Luckily we all had cell phones, and cell phone reception in Qatar is amazing. I never found a single spot in the country where I couldn't get signal. We called Fadhel, the coordinator for CMU car rentals, and he in turn called a tow truck from Triple A (like a lot of American things they exist in Qatar as well). Unfortunately the tow truck drivers did not speak good English. Since Zaher speaks Arabic, this would not have been a problem, except the tow truck drivers did not speak good Arabic either. Like many of the workers in Qatar, they were from the Indian subcontinent, and thus neither English nor Arabic was their native tongue. Compounding the language barrier was the additional problem that we didn't know exactly where we were. Two hours passed while Zaher yelled at the tow truck drivers, alternating between English in Arabic. Eventually his cell phone ran out of batteries so Irmgard had to lend him hers. In the mean time, Irmgard had to urinate, but there was no place to go as we were stuck in the desert. There was a bush a little ways down the road, but it happened to be next to a mosque. Just as Irmgrad was going behind the tree, the mosque started to blast the evening call to prayer. Zaher and I freaked out, but luckily no one saw her. We teased her about this for the rest of the semester. Finally the tow truck arrived. Unfortunately there were two people in the tow truck and there was only room for one additional person. The tow truck drivers recommended that the remaining two people ride in the car as it was being towed. Luckily this was a flat bed tow truck, so the entire car was elevated onto the bed of the truck and chained down, making this much safer than a traditional tow truck. We opted to have Zaher ride in the tow truck since he would be able to communicate best with the drivers. As we approached the city, Zaher called from the front to let us know that the tow truck drivers wanted us to lie flat. Apparently riding in a car that is being towed is illegal, which they hadn't bothered to tell us beforehand, and they didn't want the cops to see us. Luckily we arrived at the auto repair shop without incident where they replaced the tires and bent the rims back into shape. To celebrate, Irmgard took Zaher and I out to Turkey central, perhaps the best Turkish restaurant in all of Qatar. I have plenty of other stories as well, but I'm too lazy to type them up. I'm moving to California in a week to start full time employment at Apple Computer. Given my horrendous record, I probably won't be writing updates for a very long time unless something unusually exciting or interesting happens. Despite the mishaps, going to Qatar was once in a life time experience that I'm glad I took. When Majd, a professor I worked closely with and cycled with, was driving me to the airport for the final time, he asked me what I am going to miss the most about Qatar. I jokingly replied "the low gas prices". In actuality I'll probably miss the sense of community the most. The small student body and faculty size created an environment where everyone knew and cared about everyone. The small class size also allowed me to concentrate on individual students and really make a difference in their learning. Realistically I relies I will probably never go back to Qatar. I would like to return in 2016 if Doha ends up hosting the Olympic games to see how things have changed, but this is a remote possibility contingent on my time, money and priorities eight years from now. Also it would have made a lot more financial sense to start working at Apple right away instead of traveling to the middle east. What made the trip worthwhile was the experience and what I learned both about the middle east and myself. As my first time traveling and living abroad alone, I've gained self confidence and although I've made some bad decisions, I've gained some street smarts and learned to rely and depend on myself. I could still use quite a bit of improvement, especially in my negotiation skills (I was probably ripped off many times in Egypt), but at least it's a start. Also I've realized that I like teaching quite a bit and this has made me reconsider grad school. I'll be working in industry for the next few years, but I could see myself eventually go back to school, and possibly become a professor in the very distant future. Perhaps by that time, I'll get around to write another entry, and hope you'll still have the attention span to read it. I've been in Qatar for over two months now, so I am more than over due for a new entry. At this point I've settled in and thing have become much more routine. I've managed to keep myself quite busy and thus writing updates has taken a low priority. Fears that I would get bored here have proved to be unfounded at least for now. Quite a lot of stuff has happen so I'm not sure where to start. I'll start with teaching since that is the main reason I'm here. I'm a teaching assistant for 3 classes, algorithm design and analysis (15-451), effective programming in C and Unix (15-123) and introduction to computer systems (15-213). Unfortunately 15-123 meets at 8:30 am and algorithm design and analysis meets at 4:00 pm. I also decided to take technology consulting in the community (15-391). More on that later. Algorithms in my main priority since there are 14 people in that class and this is the first semester that algorithms has been offered in Qatar. 13 people in the class are seniors and for 11 of them (including Meg, the other TA from Pittsburgh) it is the one course they need to graduate. This is the first year that Carnegie Mellon Qatar will be graduating students, supposedly both the president of Carnegie Mellon and the emir of Qatar's wife will be attending the ceremony so there is a lot of pressure to make sure as many students as possible pass the class. At the same time, since the students will be getting the same degree as Carnegie Mellon Pittsburgh, it is our job to make sure they are up to Pittsburgh standards. To ensure this, we give the same homework and tests as CMU Pittsburgh as well as teach from the same lecture notes. Of course I do the grading here, and the TAs in Pittsburgh do the grading there and since the Pittsburgh TAs don't publish grading rubrics, it could be the case that we do not have the same grading standards. I try to make sure this does not happen by grading to the same standards that I did when I was a TA in Pittsburgh, but of course there is no guarantee. One of the huge differences between CMU Pittsburgh and CMU Qatar is in Qatar, even in computer science, girls outnumber the boys. My algorithms class has 3 boys and 11 girls. Eight of the girls are Qataris and 2 are Palestinian, while I believe the boys are India, Jordanian and Syrian. All of the girls, except Meg of course, wear the traditional black abaya that completely covers their hair. Only one girl wears a veil so I can still see their faces. This took a little while to get used to and made it a bit harder to learn everyone's names. The first several weeks of TAing algorithms was a bit frustrating, since the students struggled with the basic material. I gave them short quizzes in recitation, and the averages started out around around a 3/10. They have worked very hard since then and their averages have come up. It helps that we have two recitation sections scheduled while Pittsburgh only has one, so it gives us extra time to go over the material they have trouble with. Also the small class size really helps since I can work with students on an individual basis. Sometimes I think I give away too much help on the homework, so that the students do not learn how to solve the problems on their own. This is especially challenging with these set of students, who are much better at memorizing answers than thinking for themselves, in part I think due to their high school education. Nevertheless their improving quiz scores indicate that they are learning things, and hopefully that trend continues on their midterm they take this week. My other two classes are even smaller. There are seven sophomores in 15123 and two seniors 15213. The demographics are completely different for 15123. There are 5 boys and 2 girls many of whom are Indian. The class as a whole is much stronger academically. They are probably comparable to a class in Pittsburgh. Also they seem to have a passion for computers that the seniors do not have. Meg, also TAing this class likes to teach them obscure unix commands, and I often see them coding away at her desk late into the night. 15213 is just being offered for two seniors who dropped the class twice in the past, and now need it for graduation. After I gave them a five hour help session and they still struggled through the first homework assignment, I was worried about their prospects. After they completed the second assignment on their own, my confidence in them as been greatly restored. The small class size and ample funding has really allowed CMUQ to cater to the individual student. In one of the faculty meeting I attended, they discussed every single computer science freshman on an individual basis, and what they could do to help them succeed. While it is great that they can take this approach now, this will not be sustainable if CMUQ gets much bigger. For algorithms in Pittsburgh every fourth homework assignment, students have to give oral presentations in groups of three to either the professor or TAs. Due to the small class sizes and to keep grading standardized, all the presentations here were done for the professor. I attended one of the presentations out of curiosity of how the students were doing, and was impressed by their preparation and knowledge. When I got back to my desk, there was a slice of cheese cake and a valentines day thank you note from three of the girls I had help prepare for their oral presentation. I was surprised and this cute gift made my day. This stands in stark contrast to 60 miles away across the border in Saudi Arabia, where valentines day is illegal since it is viewed as a corrupting influence of the western world. Besides classes, I have been attending some of the talks that take place on campus. Due to CMU's reputation and the fact that it has a campus in the middle east, it has attracted the attention of a lot of oil companies. Oil companies are particularly interested since they want highly qualified workers who also understand the culture of the middle east. One company, I think it might have been Shell offered to hire all the graduating seniors. In addition, the Qatar foundation is attempting to make Doha the center for startups in the middle east. The new Qatar Technology Park, which is being built across the street is going to provide office space and venture capital to startups wishing to headquarter in Doha. The area is setup as a free trade zone, so there will be no taxes, and unlike in the rest of the country companies can be owned and run by foreigners. The incentives must be somewhat enticing as one former CMU professor visited to investigate opening a branch for his startup here. His startup specializes in large scale storage systems and he has many clients that are oil companies so a middle east branch made sense. One of the talks I attended was by a manager from ExxonMobil. I think the main purpose for his trip was to recruit the graduating seniors, but due to interest from the audience, he spent a lot of time talking about the details of the liquified natural gas business. Natural gas is a huge business here has Qatar has the worlds second largest reserves. I found some of the details quite surprising. For example, did you know that building an off shore drilling platform can cost between $500 million and $1 billion? I guess this means there are huge barriers to entering the oil industry and this allows companies like ExxonMobil to make huge profits. In fact ExxonMobil has been the most profitable company in the world for several years in a row. The thing I found most disturbing about his talk was when someone in the audience asked if ExxonMobil was investing in renewable resources since the world was going to run out of fossil fuels at some point. His response was that ExxonMobil was not investing in renewable resources since they believed that there was over 100 years of oil left, so they were not worried about it. It surprised me both that ExxonMobil would take such a sort sighted approach and also that they would admit to this with out trying to put any PR spin on it. I guess the speaker figured that since he was in an oil rich country, the audience would be receptive to these views. He failed to consider that he was speaking at an American university with many westerners in the crowd, who I presume we just as shocked at his answer as I was. Another interesting event I went to was the screening of the documentary "Control Room", which examines Aljazeera's coverage of the Iraq war. The films takes the mostly positive view that Aljazeera serves as a much needed counterbalance to the bias of American media. After the film was over we had a brief discussion session. One of the people in the audience use to work for Aljazeera before getting a job in IT at Carnegie Mellon. He personally knew many of the people in the film, including the reporter that was killed when the US military bombed Aljazeera's headquarters in Iraq. Towards the end of the discussion, he brought up a speech that Jared Cohon, the president of Carnegie Mellon had made a few days earlier about Carnegie Mellon opening up a research campus in Saudi Arabia. Part of the justification that president Cohon gave for going to Saudi Arabia was that by bringing Western culture to Saudi Arabia, Carnegie Mellon could help change Saudi Arabia into a more tolerant society. The IT guy then argued that Americans should not go around trying to change other people's cultures. He said that Americans were welcome to bring education to Qatar, but if their ultimate goal is to change Qatari society, they were not welcome. He then went on to list some of the negative American influences. He main complaint was the noise level of the students in the hallways which he said made it hard for him to concentrate on work and prayer. He also complained that boys and girls were allowed to sit together since in traditional Qatari culture the only contact between the sexes is through family and marriage. I was a little taken back by this, since this was the first time I had heard anyone express that conservative a viewpoint. I guess this goes to show that the American cultural influence is quite strong and I find the views of students to be much closer to my own than that of the older generation. Every other week, student activities holds a "Pizza and Politics" discussion, which is an informal debate among students and faculty over pizza from Pizza Hut. This very western style concept (and food) is held in a traditional Qatari tent in a court yard in the building. I missed the first two "Pizza and Politics" sessions since I had a schedule conflict, but was able to attend the third, which was on free speech. The debate was inspired by an agreement between all 22 countries of the Arab League to censor their media, with the exception of Qatar, which is of course home to Aljazeera, the most popular and controversial Arab news station. The students generally agreed that freedom of speech was a good thing, especially to expose government corruption, but when the subject of the controversial Danish cartoons depicting Mohammed came up, they believed such cartoons should be illegal since they were offensive to Islam. I didn't say anything in the debate, since it was my first time there and I wasn't sure want the boundaries were and I was afraid of saying something offensive. Also I was more interested in hearing the views of the students. From the questions and points that the faculty brought up, it appeared that the boundaries were the same as would be if the discussion were happening in a classroom in the United States. The faculty challenged the students on the view that Islam should not be criticized and the debate got quite heated at times, but it remained civilized and in the end I think everyone learned a lot about each other's cultures. On a completely different subject, as stated above, I decided to take the technology consulting and the community class. In this class students partner up with a local non profit organization and perform technology consulting for them. There is a spin off of this class called technology consulting and the global community which is offered over the summer where students travel to developing countries and partner up with organizations there to provide technology consulting. At one point I was thinking about doing this after I finished with Qatar, but spending seven months outside of the United States seemed a bit much as did postponing my full time job for that long. Since Qatar is obviously a foreign country to me, I figured that taking the class here would be a pretty close substitute. The project that I am working on is geared towards helping the migrant worker communities. In Qatar, like many of the oil rich gulf states, the government provides for the native citizens so many of them do not have real jobs. As a result, the vast majority of the jobs are held by foreigners. The high skilled high pay jobs tend to be held by westerners like myself, while the low skill low pay jobs are held by workers from Asia, predominately India, Pakistan, Bangladesh, the Philippines, Nepal and Malaysia. These workers often need to sign a multiyear contract in order to obtain visas and if they lose their jobs they are deported immediately. The employer is responsible for providing housing for their workers. The positive aspect of all of this is that there are essentially zero homeless people and beggars in the streets of Doha. The downside is that employers essentially have complete control over their workers lives. In some cases, the employers confiscated the passport of the workers when they arrive, then refuse to pay them the wages in their original contracts. As the workers are forced to pay for their initial plane flight here they must pay this off before they are allowed to return home. Taken to the extreme, this is essentially a form of slavery, but even not in the extreme, workers have to work long hours for very little pay. They also have to spend years away from their families with very little communication back home. The original project that I was going to work on was setting up a telecommunications center in one of the workers camps. Since sending mail to India is very pricey, but sending mail within India is cheap, the plan was that if workers wanted to write letters home, they could scan their letters and email them to a center in India, which would print them out and mail them to their destination. Also the telecommunications center could provide others services, such as cheap internet based phone calls to India. 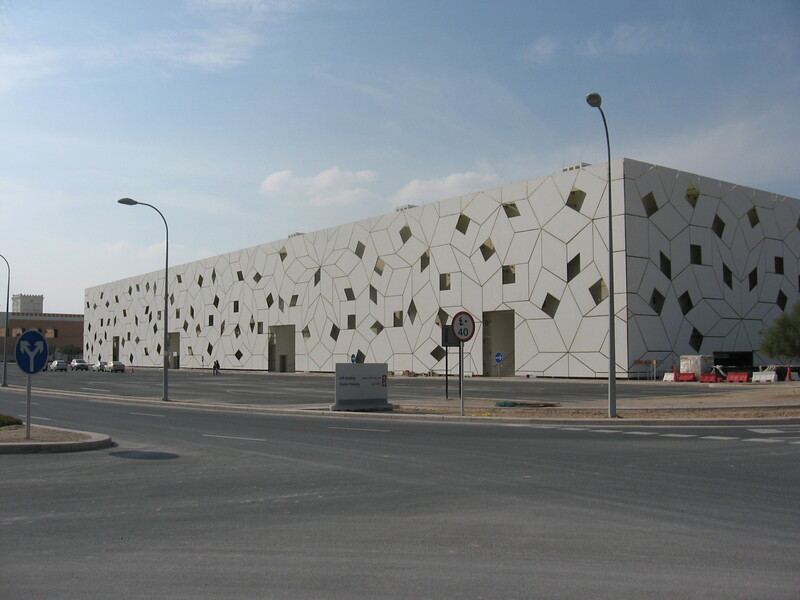 Silvia, one of the professors here had been in talks with the Indian ambassador to Qatar about this project. Unfortunately, the ambassador became very ill at the beginning of the semester, and thus the project was canceled. As a replacement, I am now working with a student organization on campus called NeoMotion to provide free computer literacy skills to the workers at Eduction City. The hope is that with these new found skills, the workers will either be able to find better jobs when they return to their home countries, or that increased computer skills will give them new ways to communicate with their families back home. Originally there were four sections of the class scheduled. One for male security guards, one for female security guards, one for facilities staff and one for cafeteria staff. Unfortunately the managers of the facilities staff have been giving us a hard time and have not allowed us to meet with them. This is especially unfortunate since they are our main targeted audience. Most of the security guards tend to be well of Qataris who could afford to pay for their own computer lessons if necessary. At least we have been able to help out the cafeteria staff who are workers from Nepal, but there are only 10 of them so the impact will not be as big. The classes had a pretty good start, but many of the students, especially the Qatari security guards have complained lately that they are starting to get bored and attendance has been dropping. Hopefully if we ever do get the facilities staff to come they will be a lot more excited to learn. In addition to the classes, there is a plan to set up a computer lab in the building for the workers to use. Currently we are using one of the regular computer labs for the classes, but IT does not allow the workers to use the computers outside of class. We just got a grant approved from Reach Out to Asia, a Qatar based charity for providing aid to Asian countries and their citizens. This will give us enough money to set up a temporary lab in the LAS building and set up a permanent lab when CMU opens in the new building. I've got two months left in the country, so hopefully this is enough time to make serious headway on the project. I was intending to write some stuff about my out of work adventures, but this post is long enough as it is. I'll save that writing for another day, and hopefully this time I won't procrastinate about it for a month.